[The first appearance of St George], it is said, as a patron of our people, occurred at the instance of Richard Coeur de Lion during his campaign in Palestine ; and this, as we shall see, really stands for a new England which might well have a new saint. But the Confessor is a character in English history ; whereas St George, apart from his place in martyrology as a Roman soldier, can hardly be said to be a character in any history. And if we wish to understand the noblest and most neglected of human revolutions, we can hardly get closer to it than by considering this paradox, of how much progress and enlightenment was represented by thus passing from a chronicle to a romance. In any intellectual corner of modernity can be found such a phrase as I have just read in a newspaper controversy : ‘Salvation, like other good things, must not come from outside.’ To call a spiritual thing external and not internal is the chief mode of modernist excommunication. But if our subject of study is mediaeval and not modern, we must pit against this apparent platitude the very opposite idea. We must put ourselves in the posture of men who thought that almost every good thing came from outside—like good news. I confess that I am not impartial in my sympathies here ; and that the newspaper phrase I quoted strikes me as a blunder about the very nature of life. I do not, in my private capacity, believe that a baby gets his best physical food by sucking his thumb ; nor that a man gets his best moral food by sucking his soul, and denying its dependence on God or other good things. I would maintain that thanks are the highest form of thought ; and that gratitude is happiness doubled by wonder. But this faith in receptiveness, and in respect for things outside oneself, need here do no more than help me in explaining what any version of this epoch ought in any case to explain. In nothing is the modern German more modern, or more mad, than in his dream of finding a German name for everything ; eating his language, or in other words biting his tongue. And in nothing were the mediaevals more free and sane than in their acceptance of names and emblems from outside their most beloved limits. The monastery would often not only take in the stranger but almost canonize him. A mere adventurer like Bruce was enthroned and thanked as if he had really come as a knight errant. And a passionately patriotic community more often than not had a foreigner for a patron saint. Thus crowds of saints were Irishmen, but St Patrick was not an Irishman. Thus as the English gradually became a nation, they left the numberless Saxon saints in a sense behind them, passed over by comparison not only the sanctity of Edward but the solid fame of Alfred, and invoked a half mythical hero, striving in an eastern desert against an impossible monster. That transition and that symbol stand for the Crusades. In their romance and reality they were the first English experience of learning, not only from the external, but the remote. England, like every Christian thing, had thriven on outer things without shame. From the roads of Caesar to the churches of Lanfranc, it had sought its meat from God. But now the eagles were on the wing, scenting a more distant slaughter ; they were seeking the strange things instead of receiving them. The English had stepped from acceptance to adventure, and the epic of their ships had begun. The scope of the great religious movement which swept England along with all the West would distend a book like this into huge disproportion, yet it would be much better to do so than to dismiss it in the distant and frigid fashion common in such short summaries. The inadequacy of our insular method in popular history is perfectly shown in the treatment of Richard Coeur de Lion. His tale is told with the implication that his departure for the Crusade was something like the escapade of a schoolboy running away to sea. It was, in this view, a pardonable or lovable prank ; whereas in truth it was more like a responsible Englishman now going to the Front. Christendom was nearly one nation, and the Front was the Holy Land. That Richard himself was of an adventurous and even romantic temper is true, thought it is not unreasonably romantic for a born soldier to do the work he does best. But the point of the argument against insular history is particularly illustrated here by the absence of a continental comparison. In this case we have only to step across the Straits of Dover to find the fallacy, Philip Augustus, Richard’s contemporary in France, had the name of a particularly cautious and coldly public-spirited statesman ; yet Philip Augustus went on the same Crusade. The reason was, of course, that the Crusades were, for all thoughtful Europeans, things of the highest statesmanship and the purest public spirit. Some six hundred years after Christianity sprang up in the East and swept westwards, another great faith arose in almost the same eastern lands and followed it like its gigantic shadow. Like a shadow, it was at once a copy and a contrary. We call it Islam, or the creed of the Moslems ; and perhaps its most explanatory description is that it was the final flaming up of the accumulated Orientalisms, perhaps of the accumulated Hebraisms, gradually rejected as the Church grew more European, or as Christianity turned into Christendom. Its highest motive was a hatred of idols, and in its view, Incarnation was itself an idolatry. The two things it persecuted were the idea of God being made flesh and of His being afterwards made wood or stone. A study of the questions smouldering in the track of the prairie fire of the Christian conversion favours the suggestion that this fanaticism against art or mythology was at once a development and a reaction from that conversion, a sort of minority report of the Hebraists. In this sense Islam was something like a Christian heresy. The early heresies had been full of mad reversals and evasions of the Incarnation, rescuing their Jesus from the reality of his body even at the expense of the sincerity of his soul. And the Greek Iconoclasts had poured into Italy, breaking the popular statues and denouncing the idolatry of the Pope, until routed, in a style sufficiently symbolic, by the sword of the father of Charlemagne. It was all these disappointed negations that took fire from the genius of Mahomet, and launched out of the burning lands a cavalry charge that nearly conquered the world. And if it be suggested that a note on such Oriental origins is rather remote from a history of England, the answer is that this book may, alas ! contain many digressions, but that this is not a digression. It is quite peculiarly necessary to keep in mind that this Semite god haunted Christianity like a ghost ; to remember it in every European corner, but especially in our corner. If any one doubts the necessity, let him take a walk to all the parish churches in England within a radius of thirty miles, and ask why this stone virgin is headless or that coloured glass is gone. He will soon learn that it was lately, and in his own lanes and homesteads, that the ecstasy of the deserts returned, and his bleak northern island was filled with the fury of the Iconoclasts. It was an element in this sublime and yet sinister simplicity of Islam that it knew no boundaries. Its very home was homeless. For it was born in a sandy waste among nomads, and it went everywhere because it came from nowhere. But in the Saracens of the early Middle Ages this nomadic quality in Islam was masked by a high civilisation, more scientific if less creatively artistic than that of contemporary Christendom. The Moslem monotheism was, or appeared to be, the more rationalist religion of the two. This rootless refinement was characteristically advanced in abstract things, of which a memory remains in the very name of algebra. In comparison the Christian civilisation was still largely instinctive, but its instincts were very strong and very much the other way. It was full of local affections, which found form in that system of fences which runs like a pattern through everything mediaeval, from heraldry to the holding of land. There was a shape and colour in all their customs and statutes which can be seen in all their tabards and escutcheons ; something at once strict and gay. This is not a departure from the interest in external things, but rather a part of it. The very welcome they would often give to a stranger from beyond the wall was a recognition of the wall. Those who think their own life all-sufficient do not see its limit as a wall, but as the end of the world. The Chinese called the white man ‘ a sky-breaker’. The mediaeval spirit loved its part in life as a part, not a whole ; its charter for it came from something else. There is a joke about a Benedictine monk who used the common grace of Benedictus benedicat, whereupon the un-lettered Fransciscan triumphantly retorted Franciscus Franciscat. It is something of a parable of mediaeval history ; for if there were a verb Franciscare it would be an approximate description what St Francis afterwards did. But that more individual mysticism was only approaching its birth, and Benedictus benedicat is very precisely the motto of the earliest mediaevalism. I mean that everything is blessed from beyond, by something which has in its turn been blessed from beyond again ; only the blessed bless. But the point which is the clue to the Crusades is this : that for them the beyond was not the infinite, as in modern religion. Every beyond was a place. They mystery of locality, with all its hold on the human heart, was as much present in the most ethereal things of Christendom as it was absent from the most practical things of Islam. England would derive a thing from France, France from Italy, Italy from Greece, Greece from Palestine, Palestine from Paradise. It was not merely that a yeoman of Kent would have his house hallowed by the priest of the parish church, which was confirmed by Canterbury, which was confirmed by Rome. Rome herself did not worship herself, as in the pagan age. Rome herself looked eastward to the mysterious cradle of her creed, to a land of which the very earth was called holy. And when she looked eastward for it she saw the face of Mahound. She saw standing in the place that was her earthly heaven a devouring giant out of the deserts, to whom all places were the same. 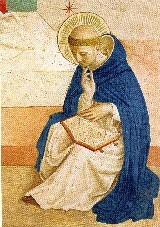 It has been necessary thus to pause upon the inner emotions of the Crusade, because the modern English reader is widely cut off from these particular feelings of his fathers ; and the real quarrel of Christendom and Islam, the fire-baptism of the young nations, could not otherwise be seized in its unique character. It was nothing so simple as a quarrel between two men who both wanted Jerusalem. It was the much deadlier quarrel between one man who wanted it and other man who could not see why it was wanted. The Moslem, of course, had his own holy places ; but he has never felt about them as Westerns can feel about a field or a roof-tree ; he thought of the holiness as holy, not of the places as places. The austerity which forbade him imagery, the wandering war that forbade him rest, shut him off from all that was breaking out and blossoming in our local patriotisms ; just as it has given the Turks an empire without ever giving them a nation. Now, the effect of this adventure against a mighty and mysterious enemy was simply enormous in the transformation of England, as of all the nations that were developing side by side with England. Firstly, we learnt enormously from what the Saracen did. Secondly, we learnt yet more enormously from what the Saracen did not do. Touching some of the good things which we lacked, we were fortunately able to follow him. But in all the good things which he lacked, we were confirmed like adamant to defy him. It may be said that Christians never knew how right they were till they went to war with Moslems. At once the most obvious and the most representative reaction was the reaction which produced the best of what we call Christian Art ; and especially those grotesques of Gothic architecture, which are not only alive but kicking. The East as an environment, as an impersonal flavour, certainly stimulated the Western mind, but stimulated it rather to break the Moslem commandment than to keep it. It was as if the Christian were impelled, like a caricaturist, to cover all that faceless ornament with faces ; to give heads to all those headless serpents and birds to all those lifeless trees. Statuary quickened and came to life under the veto of the enemy as under a benediction. The image, merely because it was called an idol, become not only an ensign but a weapon. A hundredfold host of stone sprang up all over the shrines and streets of Europe. The Iconoclasts made more statues than they destroyed. The place of Coeur de Lion in popular fable and gossip is far more like his place in true history than the place of the mere denationalised ne’er-do-weel given him in our utilitarian school books. Indeed the vulgar rumour is nearly always much nearer the historical truth than the ‘educated’ opinion of today ; for tradition is truer than fashion. King Richard, as the typical Crusader, did make a momentous difference to England by gaining glory in the East, instead of devoting himself conscientiously to domestic politics in the exemplary manner of King John. The accident of his military genius and prestige gave England something which it kept for four hundred years, and without which it is incomprehensible throughout that period—the reputation of being in the very vanguard of chivalry. The great romances of the Round Table, the attachment of knighthood to the name of a British king, belong to this period. Richard was not only a knight but a troubadour ; and culture and courtesy were linked up with the idea of English valour. The mediaeval Englishman was even proud of being polite ; which is at least no worse than being proud of money and bad manners, which is what many Englishmen in our later centuries have meant by their common sense. Chivalry might be called the baptism of Feudalism. It was an attempt to bring the justice and even the logic of the Catholic creed into a military system which already existed ; to turn its discipline into an initiation and its inequalities into a hierarchy. To the comparative grace of the new period belongs, of course, that considerable cultus of the dignity of woman, to which the word ‘chivalry’ is often narrowed, or perhaps exalted. This also was a revolt against one of the worst gaps in the more polished civilisation of the Saracens. The Moslems naturally suffered from the older Oriental sentiment about women ; and were, of course, without the special inspiration given by the cult of the Virgin. It is false to say that the chivalric view of women was merely an affectation, except in the sense in which there must always be an affectation where there is an ideal. It is the worst sort of superficiality not to see the pressure of a general sentiment merely because it is always broken up by events ; the Crusade itself, for example, is more present and potent as a dream even than as a reality. From the first Plantagenet to the last Lancastrian it haunts the minds of English kings, giving as a background to their battles a mirage of Palestine. So a devotion like that of Edward I to his queen was quite a real motive in the lives of multitudes of his contemporaries. When crowds of enlightened tourists, setting forth to sneer at the superstitions of the continent, are taking tickets and labelling luggage at the large railway station at the west end of the Strand, I do not know whether they all speak to their wives with a more flowing courtesy than their fathers in Edward’s time, or whether they pause to meditate on the legend of a husband’s sorrow, to be found in the very name of Charing Cross. But it is a huge historical error to suppose that the Crusades concerned only that crust of society for which heraldry was an art and chivalry an etiquette. The direct contrary is the fact. The First Crusade especially was much more an unanimous popular rising than most that are called riots and revolutions. The Guilds, the great democratic systems of the time, often owed their increasing power to corporate fighting for the Cross ; but I shall deal with such things later. Often it was not so much a levy of men as a trek of whole families, like new gipsies moving eastwards. And it has passed into a proverb that children by themselves often organised a crusade as they now organise a charade. But we shall best realise the fact by fancying every Crusade as a Children’s Crusade. They were full of all that the modern world worships in children, because it has crushed it out of men. Their lives were full, as the rudest remains of their vulgarest arts are full, of something that we all saw out of the nursery window. It can best be seen later, for instance, in the lanced and latticed interiors of Memling, but it is ubiquitous in the older and more unconscious contemporary art ; something that domesticated distant lands and made the horizon at home. They fitted into the corners of small houses the ends of the earth and the edges of the sky. Their perspective is rude and crazy, but it is perspective ; it is not the decorative flatness of orientalism. In a word, their world, like a child’s is full of foreshortening, as of a short cut to fairyland. Their maps are more provocative than pictures. Their half-fabulous animals are monsters, and yet are pets. It is impossible to state verbally this very vivid atmosphere ; but it was an atmosphere as well as an adventure. It was precisely these outlandish visions that truly came home to everybody ; it was the royal councils and feudal quarrels that were comparatively remote. The Holy Land was much nearer to a plain man’s house than Westminster, and immeasurably nearer than Runymede. To give a list of English kings and parliaments, without pausing for a moment upon this prodigious presence of a religious transfiguration in common life, is something the folly of which can but faintly be conveyed by a more modern parallel, with secularity and religion reversed. It is as if some Clericalist or Royalist writer should give a list of the Archbishops of Paris from 1750 to 1850, noting how one died of small-pox, another of old age, another by a curious accident of decapitation, and throughout all this record should never once mention the nature, or even the name, of the French Revolution.